I think this was a first time walking along Deepdale and certainly a first time viewing and climbing Fairfield from this direction. The coves (they’d be cwms in Snowdonia) of Link Cove and Houndshope Cove and the great north-east faces of Fairfield, Hart Crag and Dove Crag are a great reason to come this way and reminded me of the cwms of the Glyders. Also I’d often looked at Greenhow End and wondered about ways up it and my walk book described a scrambly route up. 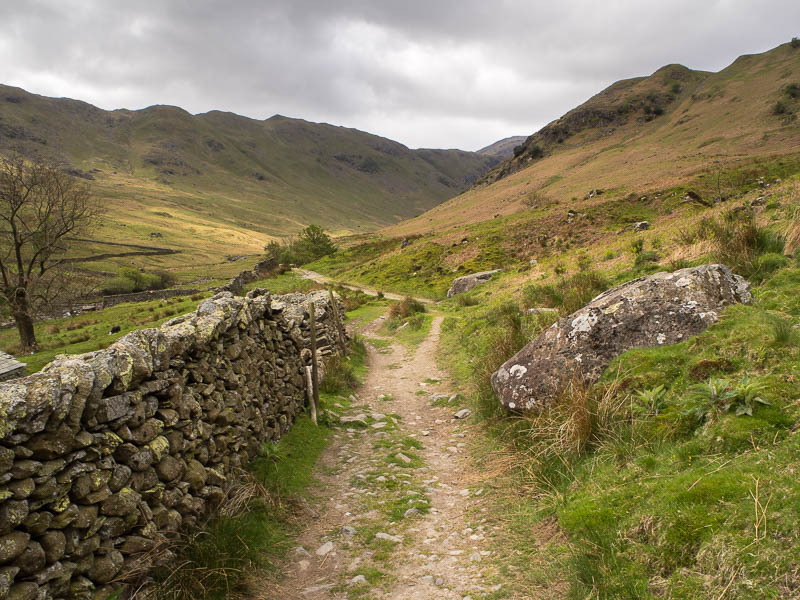 I started from the car park at Cow Bridge, just north of Brotherswater and walked up the road to pick up the route at Deepdale Bridge then straightforward walking along the valley. The first navigation choice was when to cross the beck and start working my way up to Greenhow End. 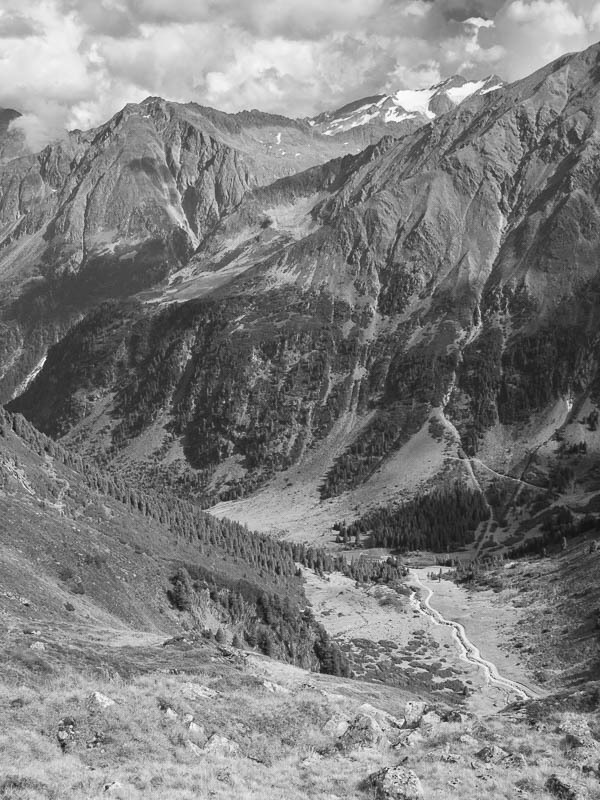 The book described this as after a glacial moraine and when there are two parallel streams to the left of the path. 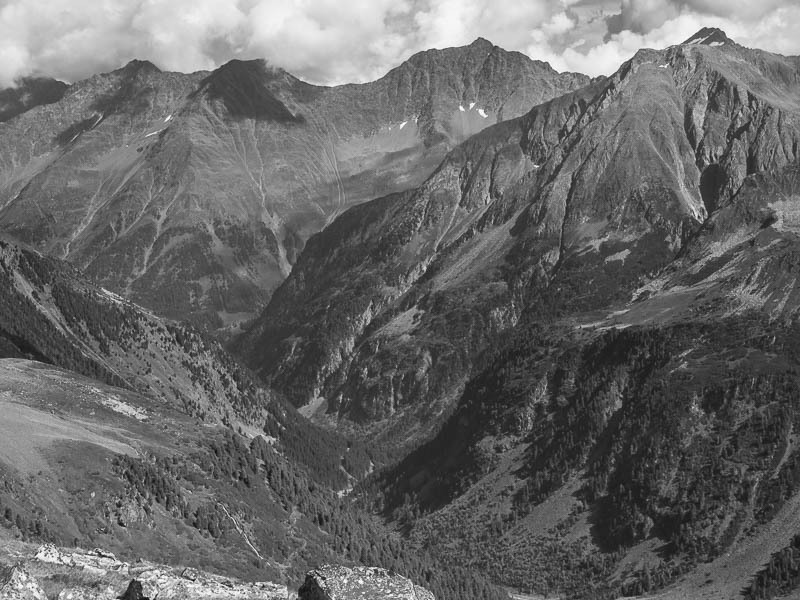 Moraines in this country aren’t quite the same as those in Switzerland but fairly obvious if you’re looking for them. 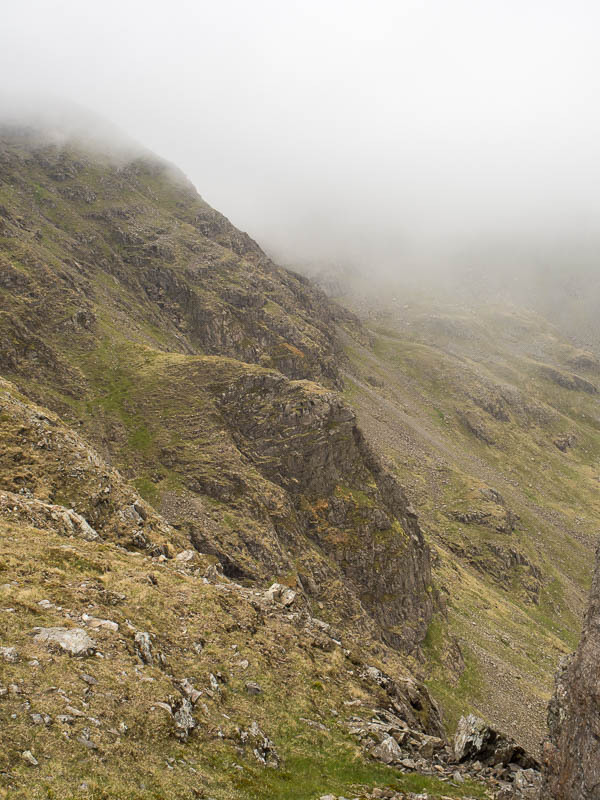 Also I knew the route went fairly close under the front of Mart Crag. 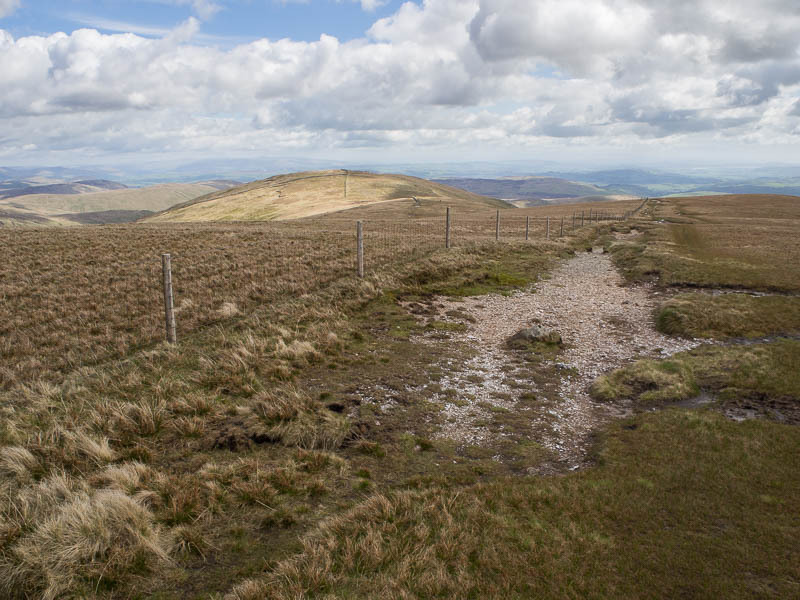 I found the two parallel streams, crossed over, and started up the pathless slopes towards Greenhow End. The front (north-east) face doesn’t look promising – steep, damp, vegetated. I kept going until I was on the lip of Link Cove and looking into it. 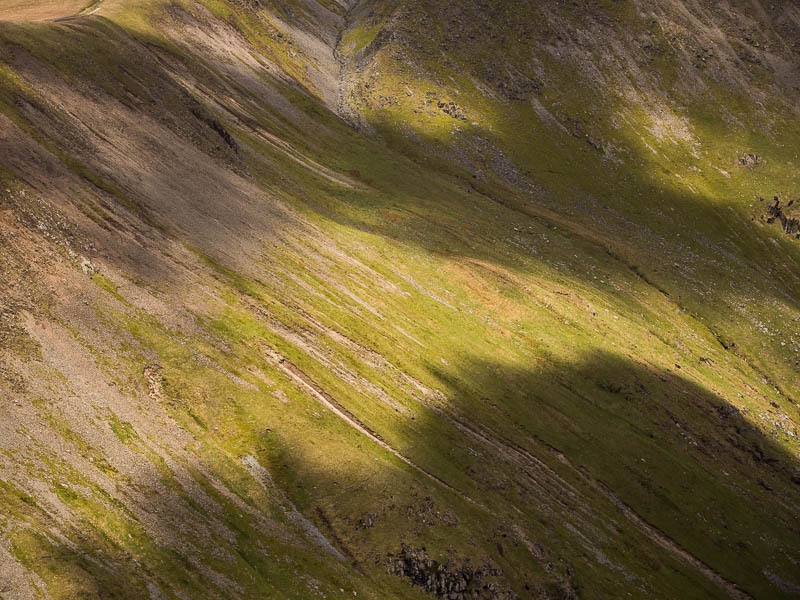 Then the crags became cleaner, less steep and much more inviting to scramble on. Looking up Deepdale from near the start. 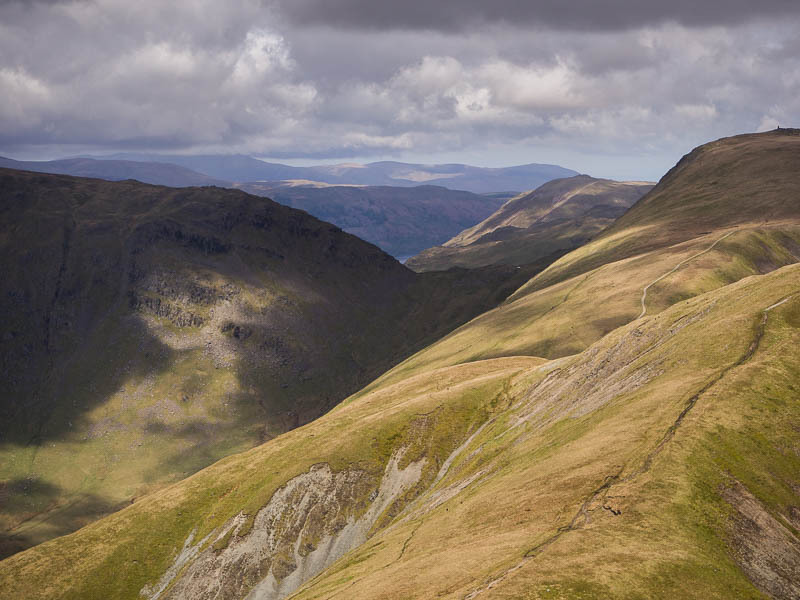 The ridge of Hartsop above How, looking south-east from half way up Greenhow End. I could see the grass rake described in the book but the direct route straight up the easy rocks looked much nicer. 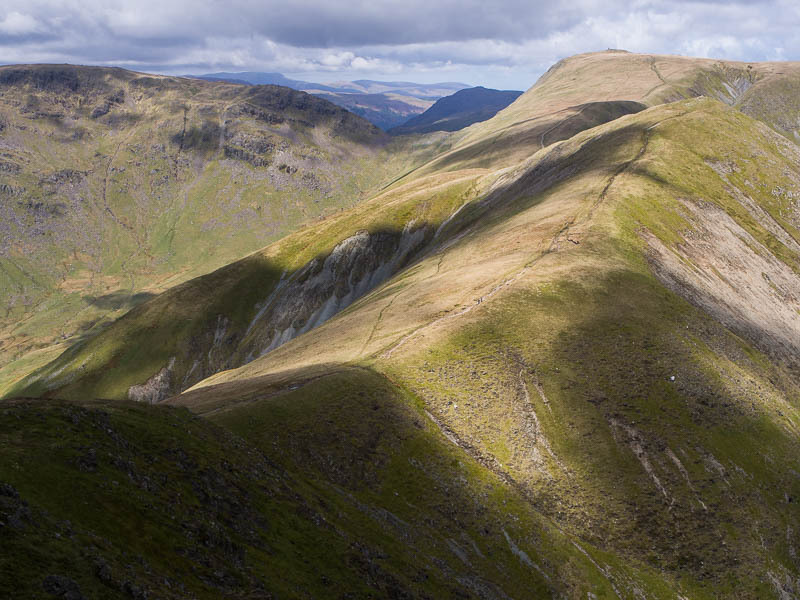 This gave probably about a hundred metres of moderate scrambling on rough rock with small holds, probably grade I to II, straight up until you reach the ridge leading to the (usually) busy Fairfield horseshoe path, a fairly obvious path marked by lots of cairns. 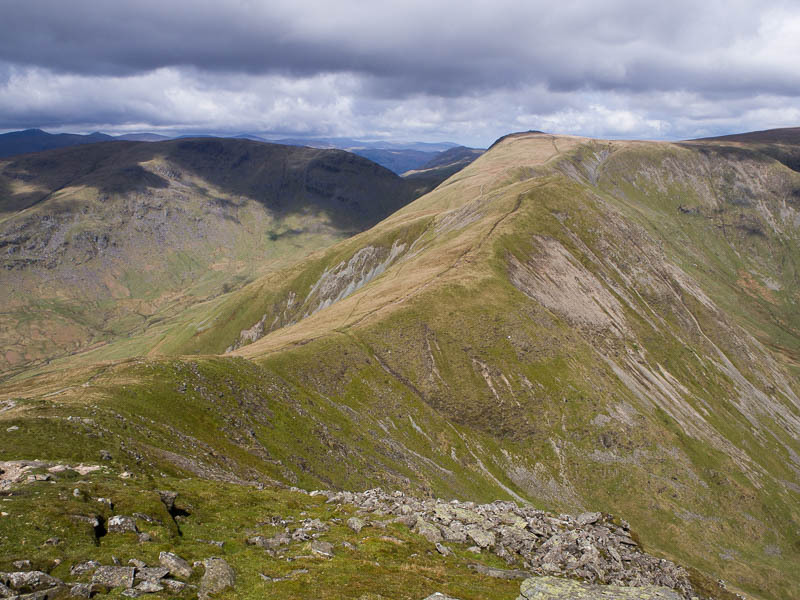 Part of the north east face of Fairfield seen from the top of Greenhow End. 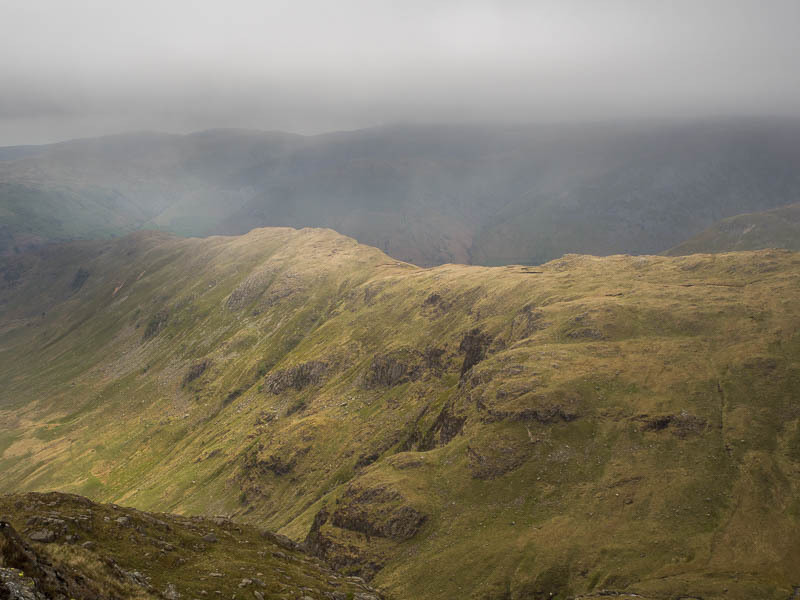 Turn right to reach Fairfield summit, featureless apart from three cairns/shelters. 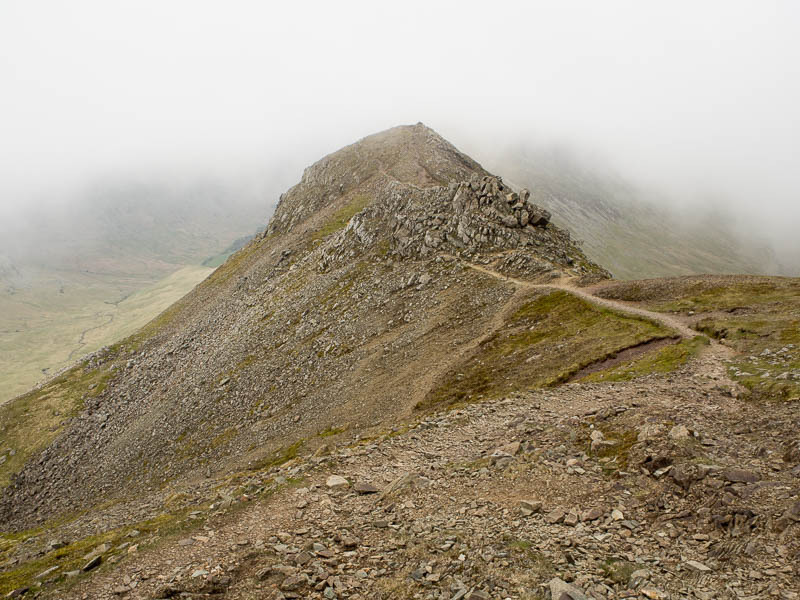 By now the cloud had come down (and was very cold, typical May bank holiday weather) and I couldn’t see the onward route to Cofa Pike. I was worried about finding this. 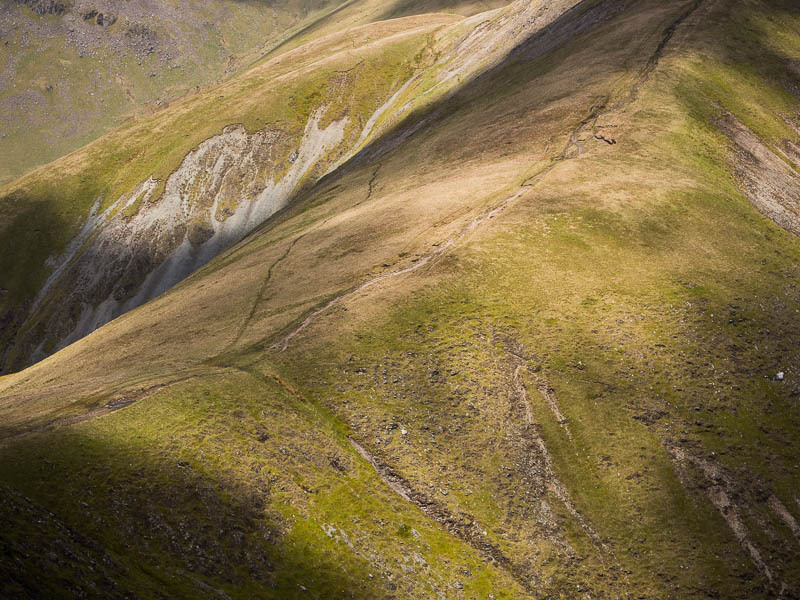 From the map it looked like it might be a vague path down steep slopes with crags on either side with the risk of taking the wrong line and ending up on tricky ground but in fact as long as you head north you would struggle to miss it and Cofa Pike is right there in front of you. Cofa Pike from Fairfield. The jumble of rocks half way can be taken direct very easily and the crest of the ridge followed. This is described in my book as a “devil’s tooth” and I’d agree with the tooth part, though I’m not sure where the devil’s part comes in. The path suggests going round it but actually I’d say it’s best to attack it straight on, sticking right to the crest. It’s much easier than it looks. Stick to the top of the ridge all the way down to Deepdale Hause and it’s a pleasant scrambly steep path (though the initial part from Fairfield summit is unpleasantly loose). 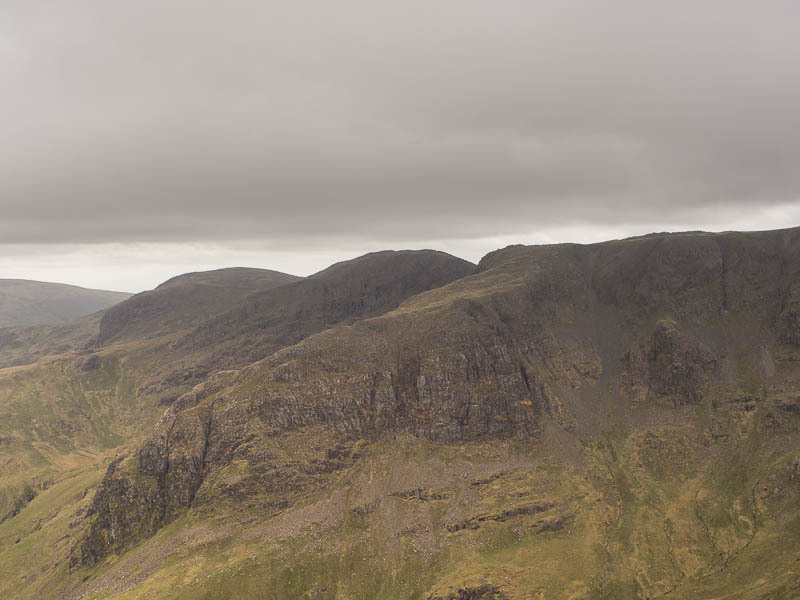 Next summit is St. Sunday Crag. I was out of the clouds now so had better views. Few people about, despite being bank holiday week. The route down has good views of Ullswater and eventually lots of bluebells. 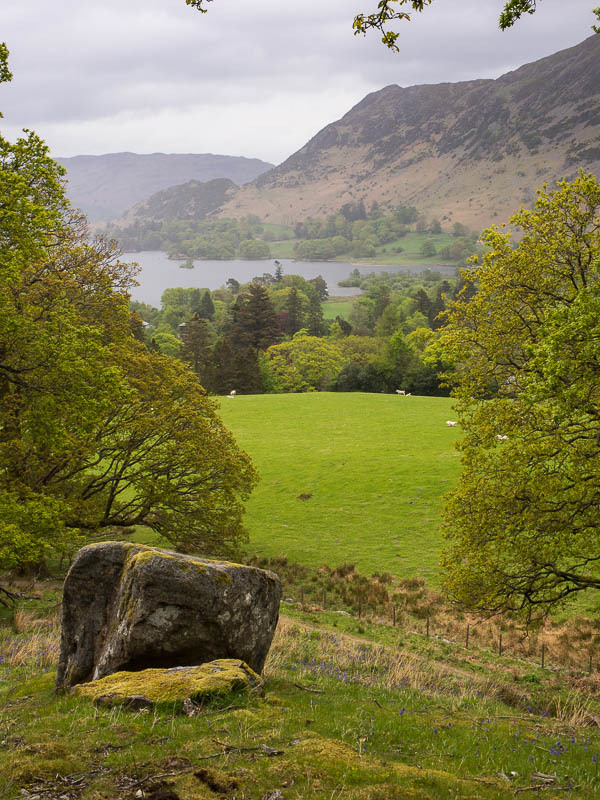 It was trying to rain as I got near the valley and I sheltered under a tree hoping in vain that it would pass. 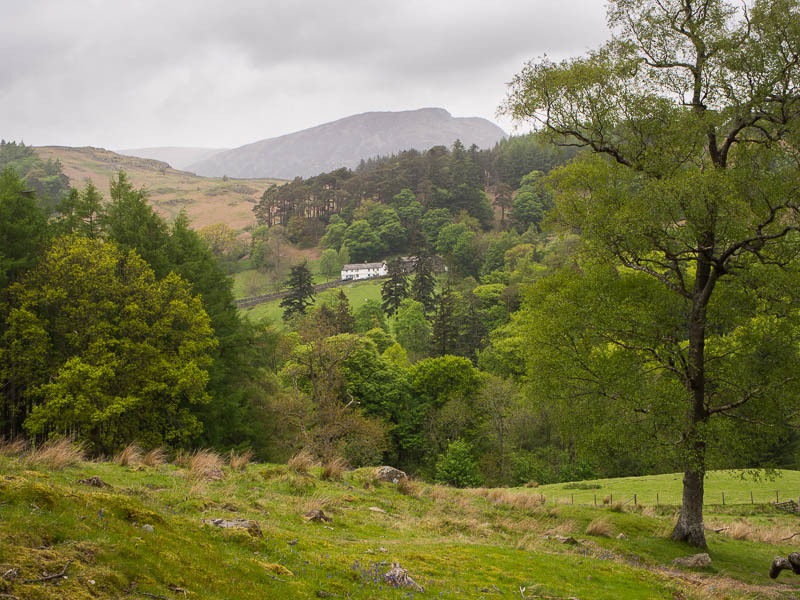 It turned out to be the start of constant heavy rain (lasting all evening) so I took the quick route back to the car, along the road from Patterdale. 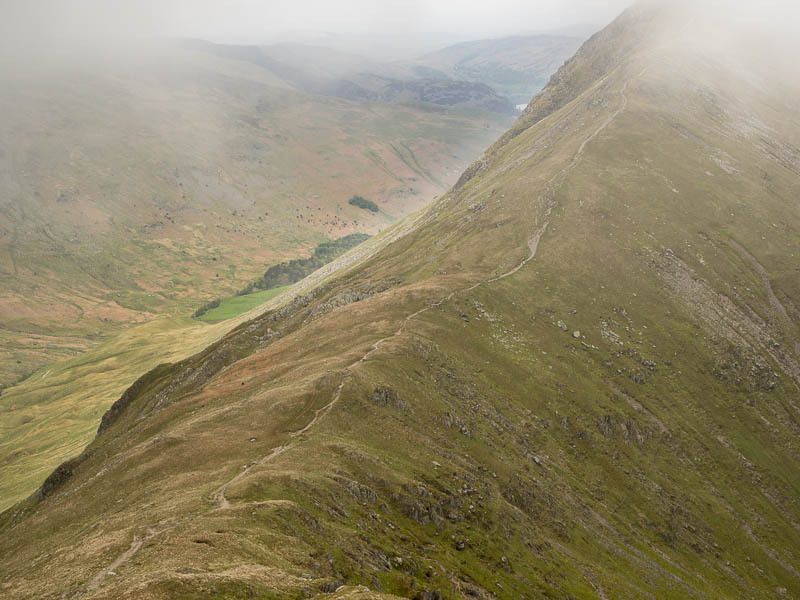 At the base of the path up to St Sunday Crag at the entrance to Grisedale looking north. 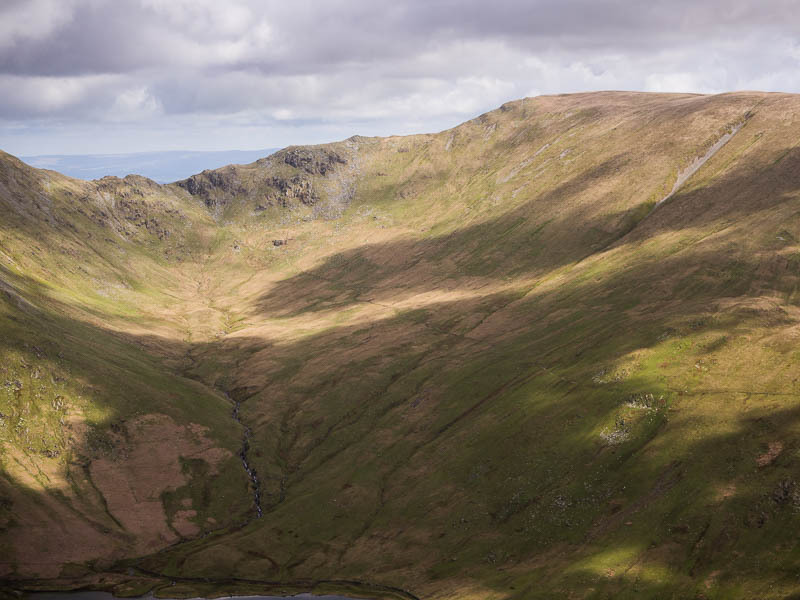 If you plan to walk from Kentmere get there early. The tiny parking area was full so I back-tracked half a mile to find a socially responsible spot to leave the car for the day. 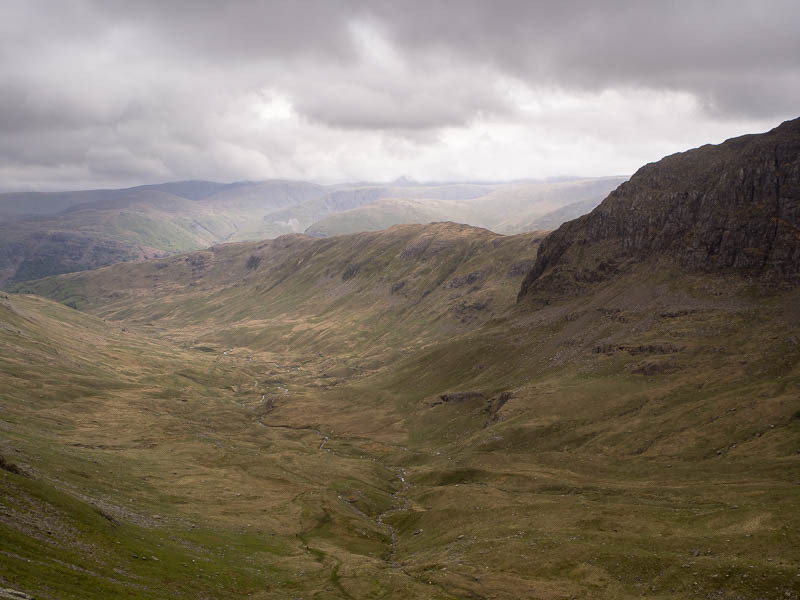 Every time I’ve driven up Kirkstone Pass I’ve seen the west flank of these hills looking amazing. This round is in one of my nice coffee table walk books and sounds great. 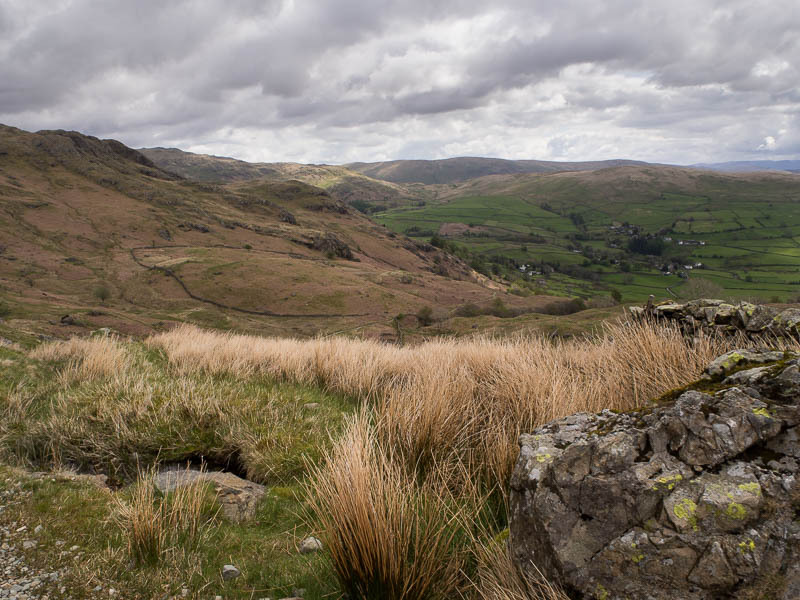 The valley leading to the hamlet of Kentmere is lovely and Kentmere itself is charming and sleepy, spread out around wiggly lanes beneath the high hills. 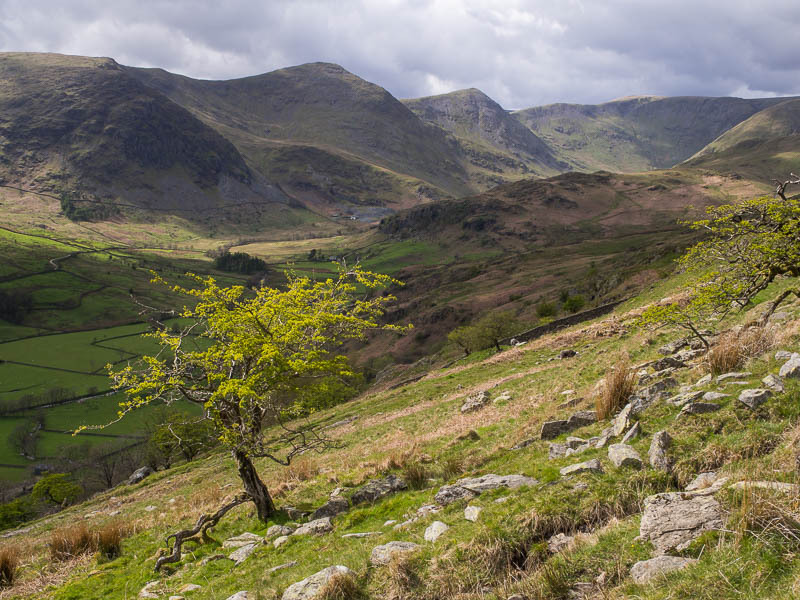 The valley is green and flowery with rounded summits all round and some interesting craggy bits at the start (which can be scrambled on, according to another book). 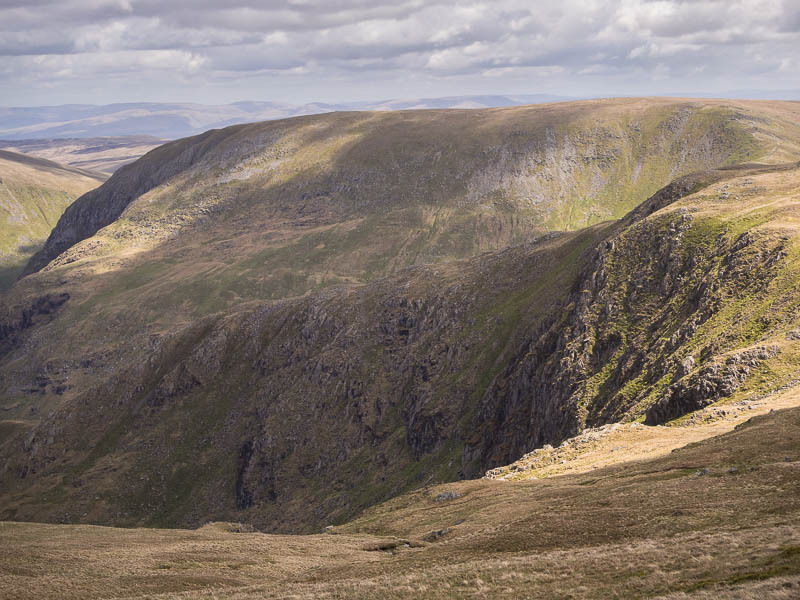 The Garburn Pass is the first destination, then height and distance are gained easily and steadily until the first summit of Yoke. First lunch stop was half a mile later on top of Ill Bell, with it’s two trig-point-shaped cairns and magnificent views. 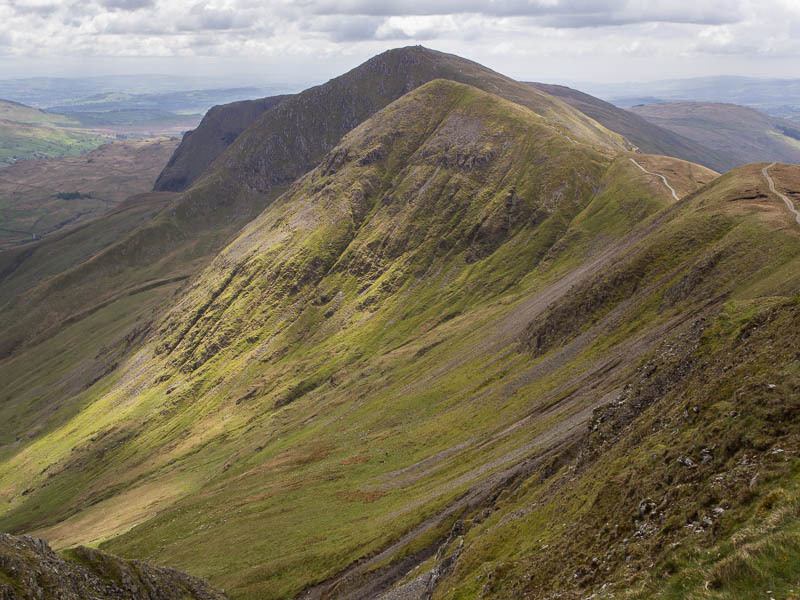 The onward ridges look particularly inviting. The weather wasn’t as sunny as promised but this has benefits for photography so I wasn’t complaining. 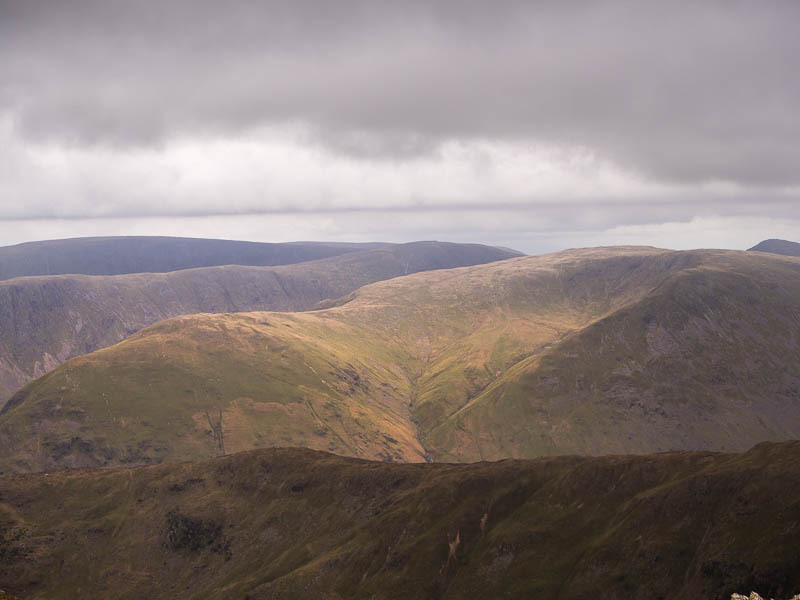 Navigation gets a little harder when you reach the wide spaces of Thornthwaite Crag (nothing craggy about it from this direction) and High Street. 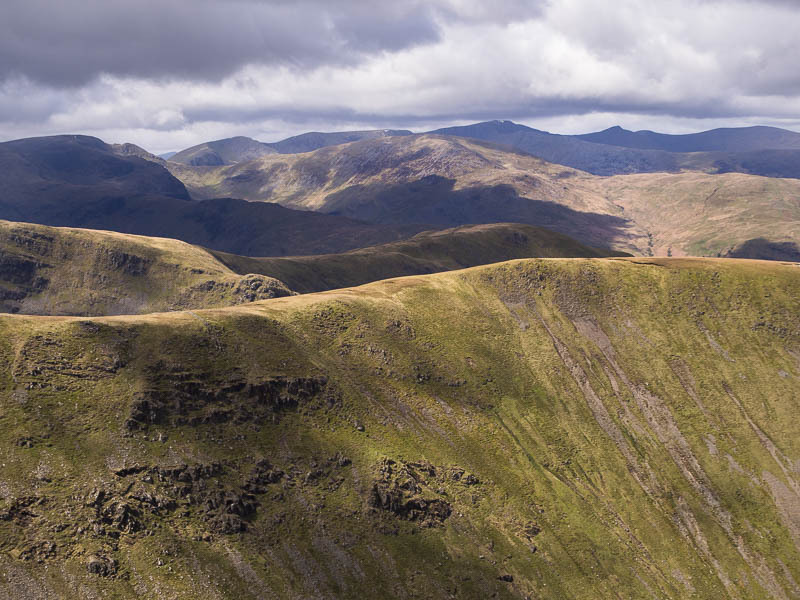 Few aids to navigation, except a wall (marked) and a trig point on High Street (not marked on my OS map) but it wasn’t too hard to compare the map with reality and work out the way to Mardale Ill Bell and Nan Bield Pass. 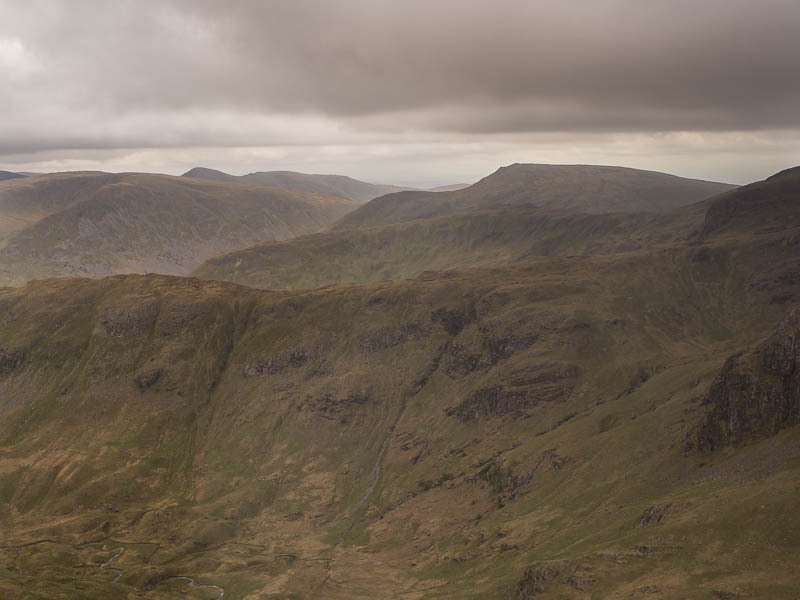 The book route then goes down from the pass to the valley but I still had plenty of energy and it seemed a shame not to carry on round the summits so I went up to Harter Fell. 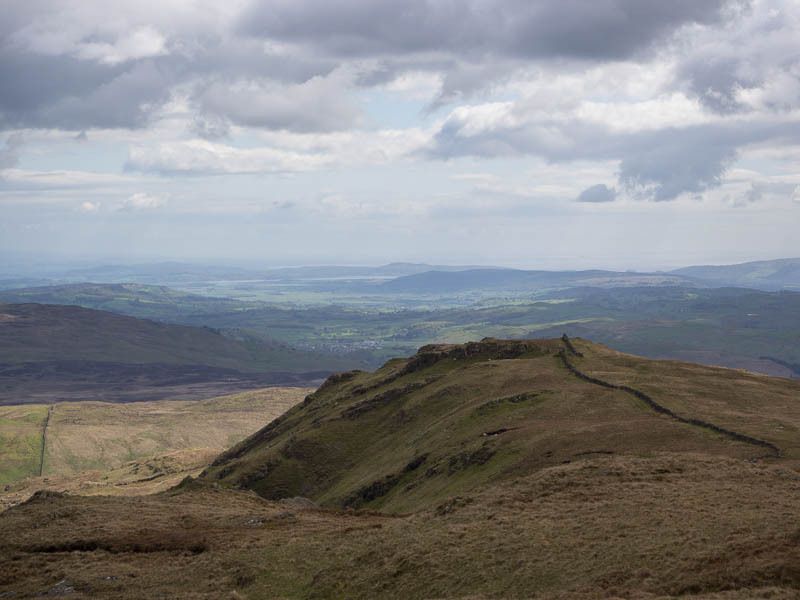 The onward route south is now much flatter, more like high moorland than a ridge (there isn’t really a word to describe this – “flat” isn’t right to describe a very blunt widely spread ridge but I can’t think of a better one). 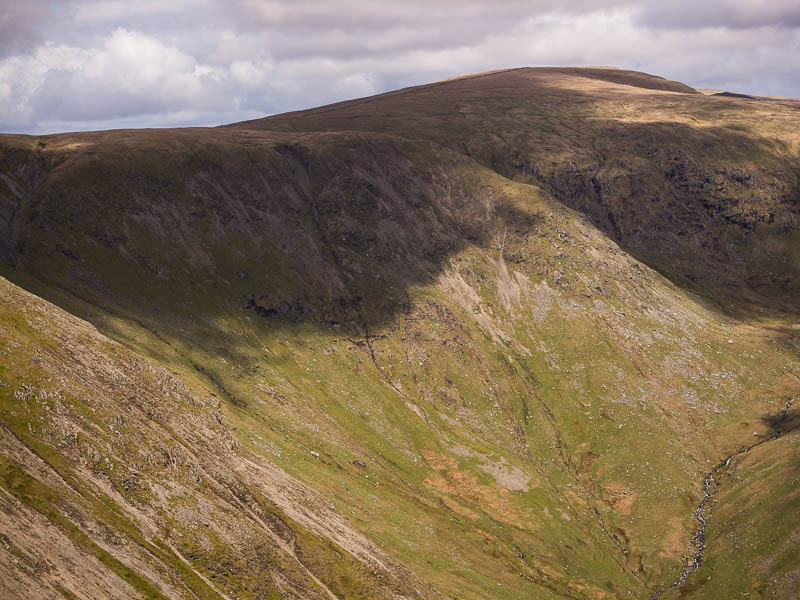 The “flat” wide ridge on the return leg looking towards Kentmere Pike (sunlit in the middle distance). 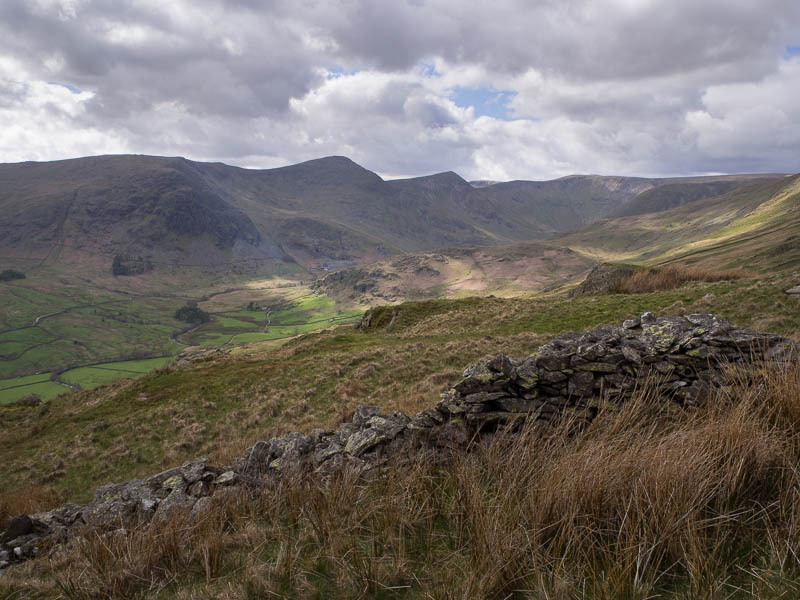 When I arrived at Kentmere Pike and an eat/drink stop I looked at the map and realised I’d done this part of the walk before when I did a round from Sadgill, now just below me to the east. I hadn’t recognised it because a) I was going in the other direction and b) it was socked in with cloud last time. Looking northwards to the first half of the route, with Ill Bell and Yoke and Froswick and you can just see the green meadows where the hamlet of Kentmere is. 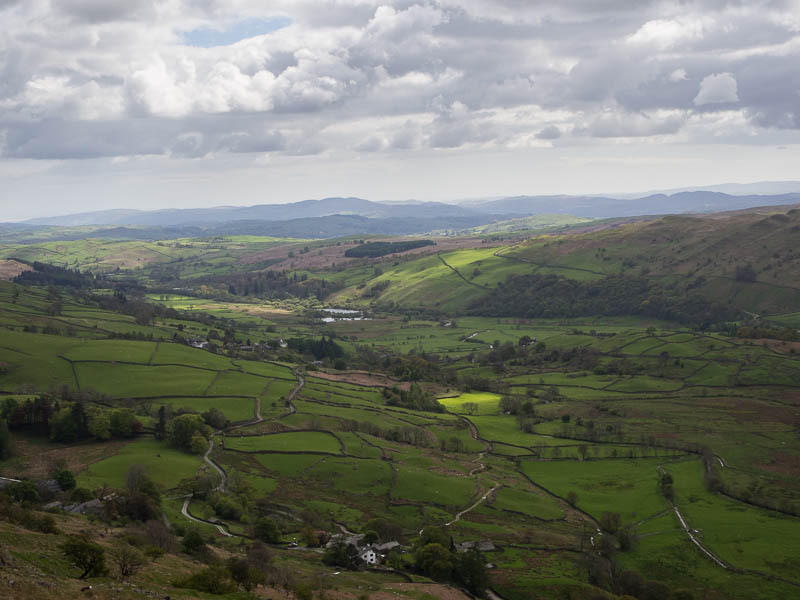 I took a path from Kentmere Pike to the valley which I had suspected might be hard to follow and it was. Very little evidence of it on the ground but there’s a wall as a useful landmark and there is a sloping trickle of water that follows the line the path is shown as taking on the map and I thought this looked like the right kind of terrain feature so I followed it, eventually finding a gate into a track by a few houses which looked like exactly where I was supposed to be. 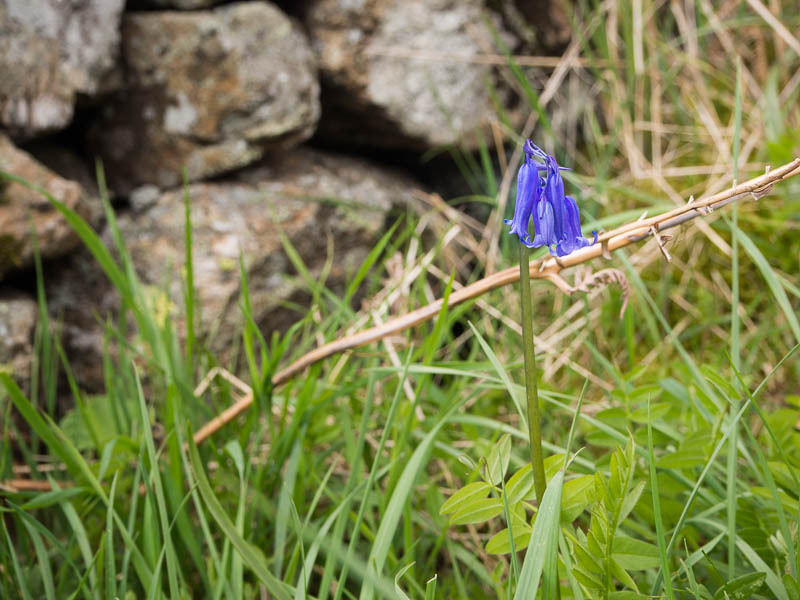 It was now about a mile and a half of road walking to the car but these are tiny single-track roads with dry-stone walls and flowers and blossom so no hardship. I found later at home that I could have carried on the high level route to Shipman Knotts (about a mile further on than where I started the descent) which would have made for a more satisfying finish but I guess that gives an excuse to do this walk again. We’re just back from walking a section of the recently completed Wales Coast Path, from Chepstow to Port Eynon. Some really nice bits but also, on this section, a fair amount of urbanisation, industry, and road walking. The stretch we did is about a hundred miles (give or take) and we did it over two weeks (eleven days walking). Mostly flat and easy walking, very well signposted and easy to follow. It starts out as estuary but gradually it widens and the waves get bigger and it feels more like seaside. Lots of flowers all the way. 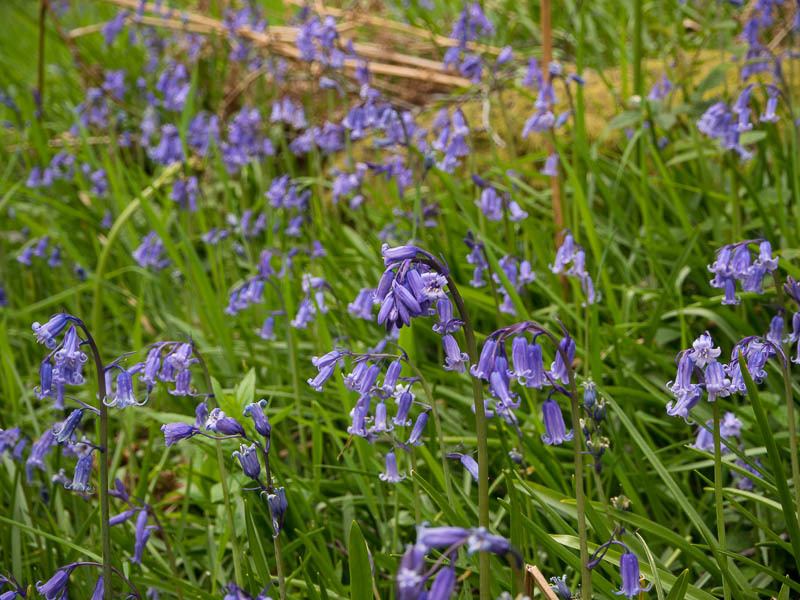 Especially good for bluebells and wild garlic in places. Once you get to Swansea it gets really nice, from Mumbles onwards, so I’m very much looking forward to the next section we do. The big thing I missed, compared to the South West Coast Path (our benchmark for a great long distance walk), was idyllic cafes. This first stretch isn’t set up as a tourist destination in the same way that Devon and Cornwall are. That may change in the next sections, which I think will be much more touristy. Not great photography though, or at least I found it very hard. If I salvage any good shots I’ll put them up here. 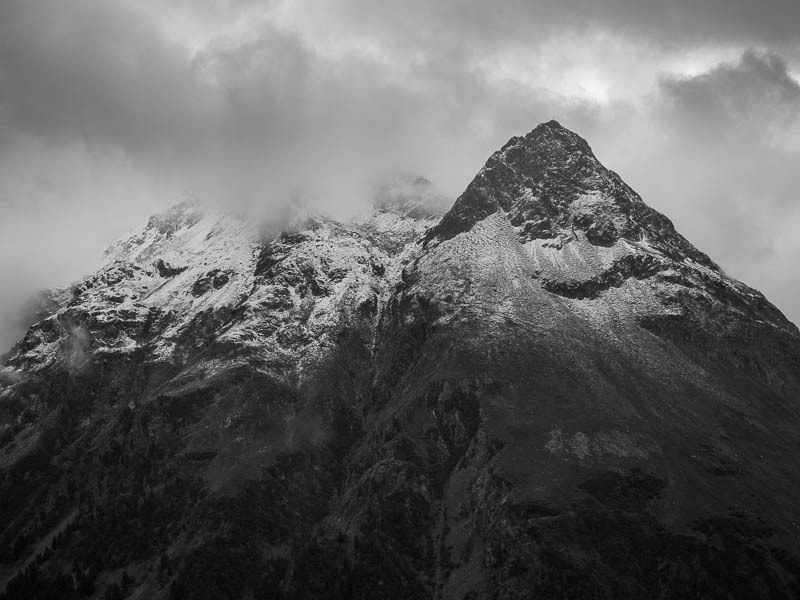 I’ve added a new monochrome gallery.